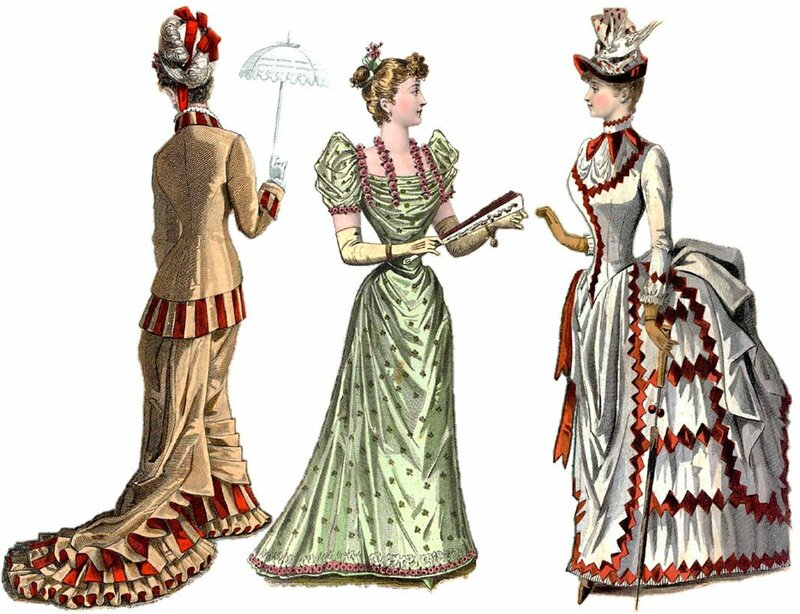 Women's clothing of the 1870s and 1880s was heavily trimmed, ornamental, and draped. 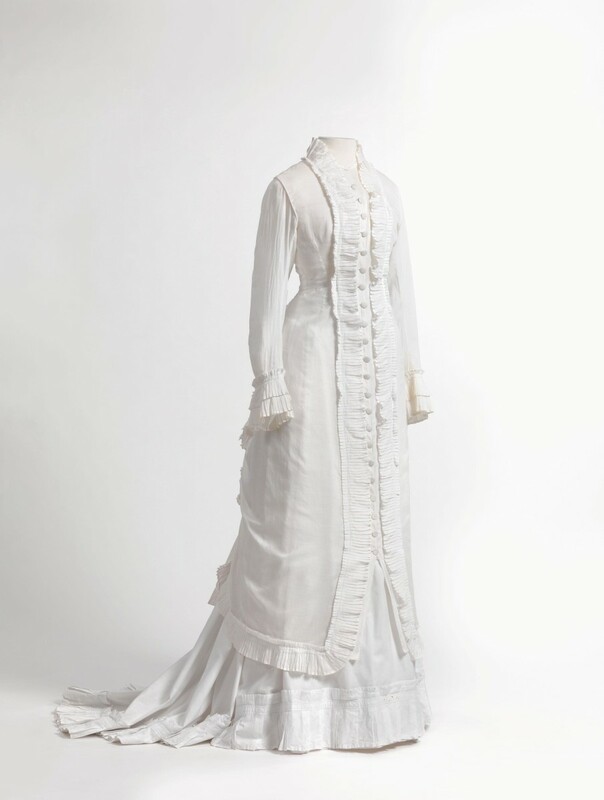 The hourglass figure of the mid-19th century gave way to a longer, slimmer silhouette with narrow skirts. 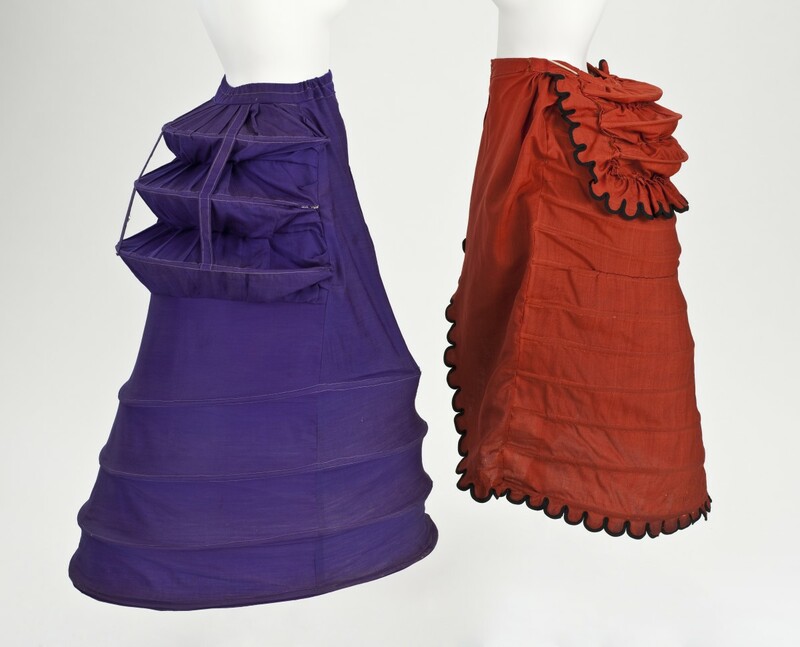 Emphasis on the back of the skirt grew from fabric gathered at the rear to the exaggerated, shelf-like bustle of the mid 1880s. During the 1870s and 80s the Industrial Revolution produced a concept of conspicuous consumption. Capitalism generated a new type of elite and class consciousness. When once status was based on royalty, nobility, and land ownership, a new social elite grew out of industry. The Victorian ideal of morality based on financial success tied self identity with consumption. As mass production increased the availability of products the producers of those goods needed new customers. Advertising, fashion magazines, and department store marketing enticed a materialistic culture to desire novelty, luxury, and ornamentation. Architecture and interior design looked to historic periods for inspiration. Furniture and buildings reflected and mixed Gothic, Renaissance, Rococo, and Louis XVI styles. Department stores lured shoppers with lavish displays, creating the concept of shopping as entertainment. Self identity merged with the consumption of increasingly ostentatious products. 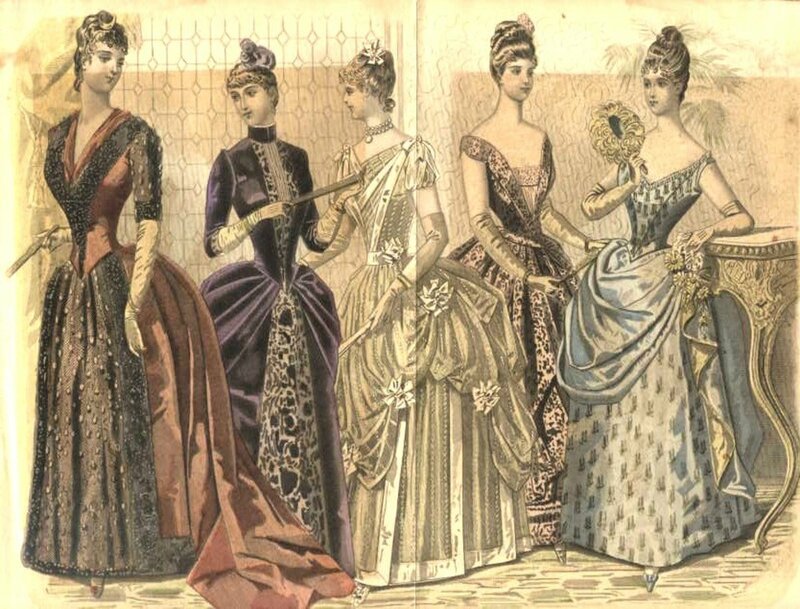 Combine these new social norms with the ideal of feminine status displayed by immobility and you have the basis for fashions of the Late Victorian era. Elite women did not work. A stiff, rigid posture underscored the lack of movement that separated the upper class from the working class. 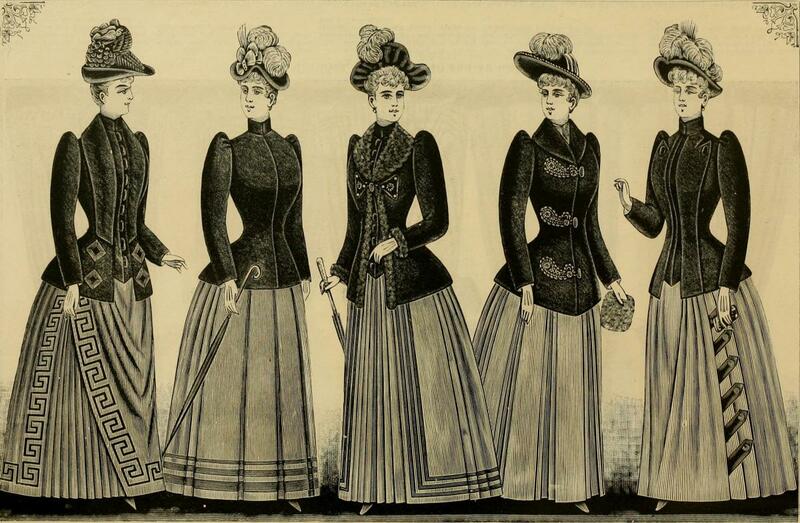 Fashions of the period are easily gleaned from photographs, advertising, fashion magazines, and fashion plates. 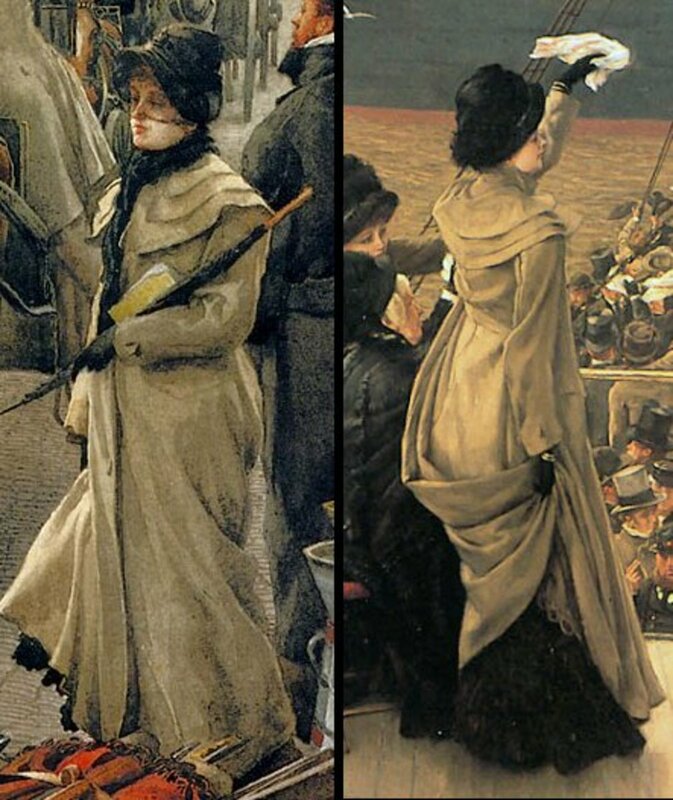 While portraiture and painting does not always reflect styles of the day, some artists depicted what women wore.The painter James Tissot depicted women in contemporary costume. August Renoir's paintings reflect the clothing worn by the middle and working class. Tight fitting sleeves reached 3/4 length or to the wrist. Coat sleeves were fitted and ended in deep cuffs. Sleeves were set higher that than earlier when drop shoulders restricted arm movement. Skirts usually matched the bodice. Horizontal draping and over skirts required copious amounts of fabric. Over skirts were gathered at the back, supported by a bustle that was attached to a crinoline. 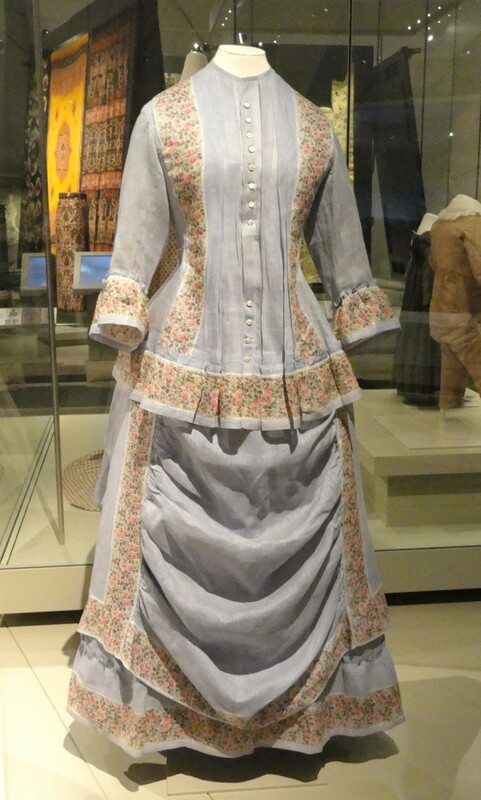 Many women kept two bodices for every skirt - one for day wear and one for evening. Evening bodices were often off the shoulder with very short or elbow length sleeves edges with ruffles. Evening bodices also featured more decorative embellishments than for day wear. Necklines came in V neck, rounded, or squared styles. More open necklines could be filled with a lace frill or chemisette. Low neck bodices featured high necks at the back. The bustle grew small with the introduction of the cuirass. Bodices featured a below the waist point in front and fit smoothly over the hips. The skirt grow a long, heavy train. Embellishments appeared low and at the back of the skirt. Narrow skirts made walking difficult resulting in small, mincing steps. Some skirts featured horizontal draping created with hidden strings and hooks. The bustle came back in a big way. A large, shelf like protrusion at the rear was more exaggerated than the softly draped bustle of the 1870s. Trains mostly disappeared and hemlines ended a few inches above the floor. Wrist length sleeves remained tight. Small puffs developed at the top of the sleeve, a precursor to the balloon like leg-of-mutton sleeves of the 1890s. The bodice remained closely fitted with short basques or polonaise styles. This was a longer coat like dress worn open over an underskirt. Long, belted blouses hung to the hip. 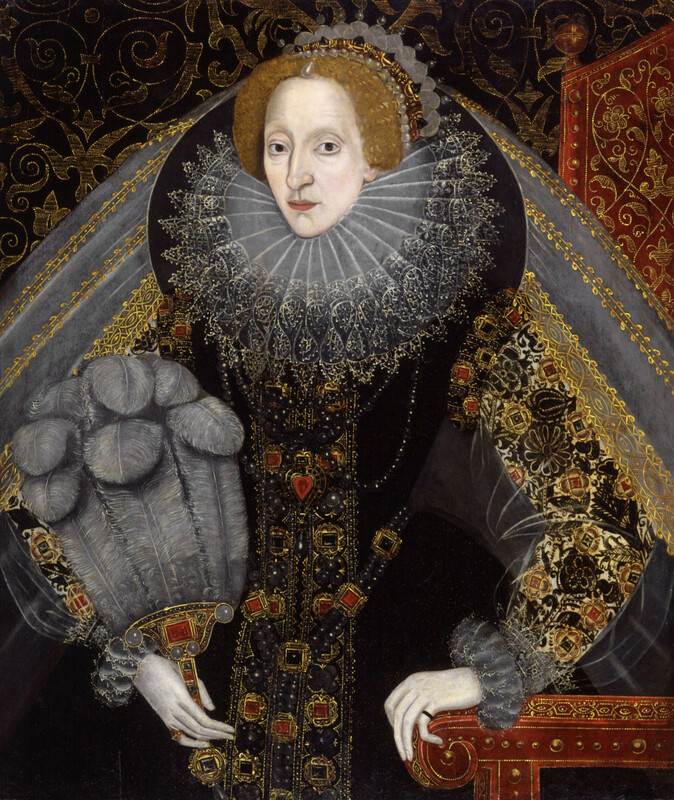 High collars worn closely fitted were supported with whale bone and came attached to bodices, dresses, or jackets. 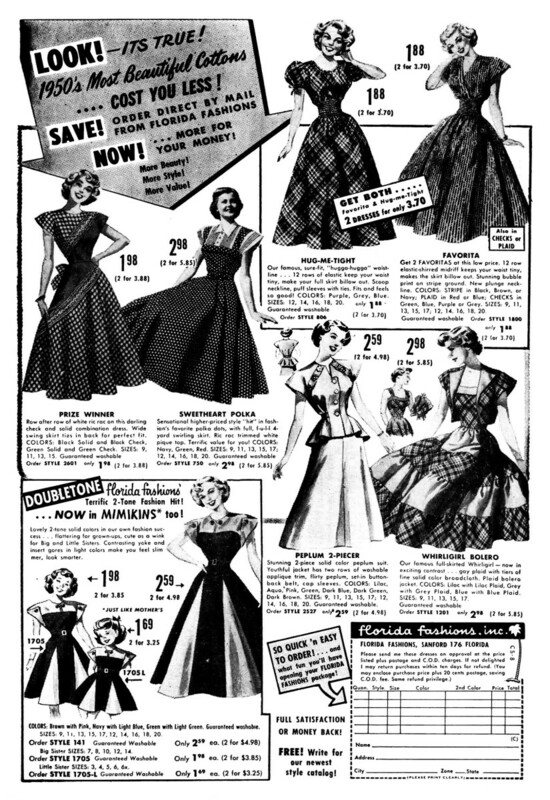 Polonaise cut bodices and gowns recalled women's fashions of the 1700s. The bodice portion extended below the waistline and hung like a long, open robe or coat. Polonaise could appear as a gown that was cut away in the front, then drawn back over the hips. Some polonaise styles appeared quite gaudy with the under and over dress made of contrasting fabrics, or one printed and one plain fabric. Trim made of one portion decorated the other and vice versa. Some critics complained of the patchwork look and odd arrangement of trim. Dolly Varden was a polonaise style named after a character in a Charles Dickens novel. Similar to 18th century styles, bright colors and floral patterns came in cotton, chintz, or muslin. A princess line dress recalls medieval gowns. Full length pieces of fabric are joined to create a straight line without a defined waist. Form is created with darts. A princess dress worn a la polonaise with an overdress draped back towards the rear. some featured a pattern or different colored front panel. Artists of the Aesthetic Movement often designed the clothing worn by their models. The movement, originating in the 1840s saw the mass production brought by the Industrial Revolution as dehumanizing and sought a simpler beauty based on craft and historic styles. The forms and designs introduced by these Pre-Raphaelite artists began to influence women's clothing. The tea gown, born of these softer designs was worn by women at home when they received friends for tea. 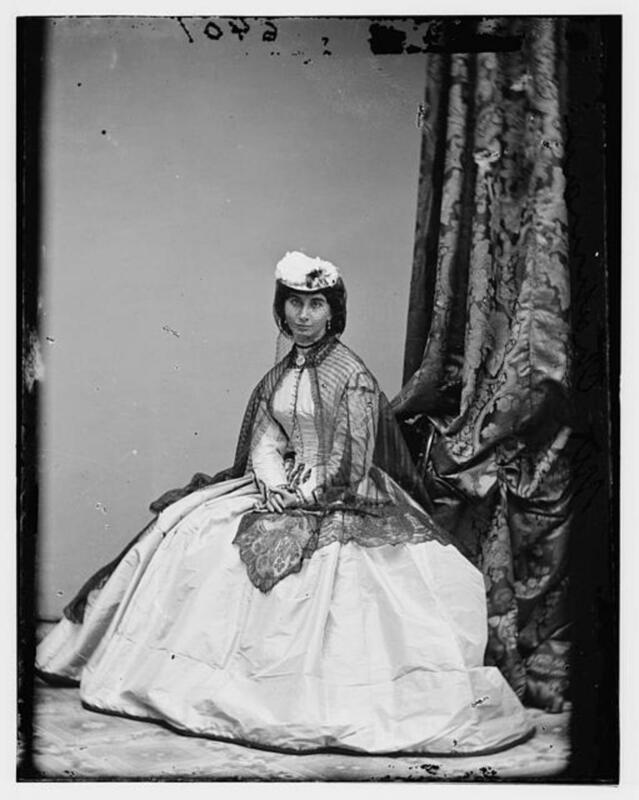 Tea gowns were worn without corsets. More comfortable than the standard day wear, tea gowns were loose and often featured loose flowing sleeves.They could be practical or decorated with lace and flounces for a soft, romantic look. Women engaged in tennis, croquet, boating, riding, and golf. Tennis costumes were produced in soft knit fabrics called jersey, named after the famous actress, Lillie Langtry, the Jersey Lily (she was born on the British island of Jersey). 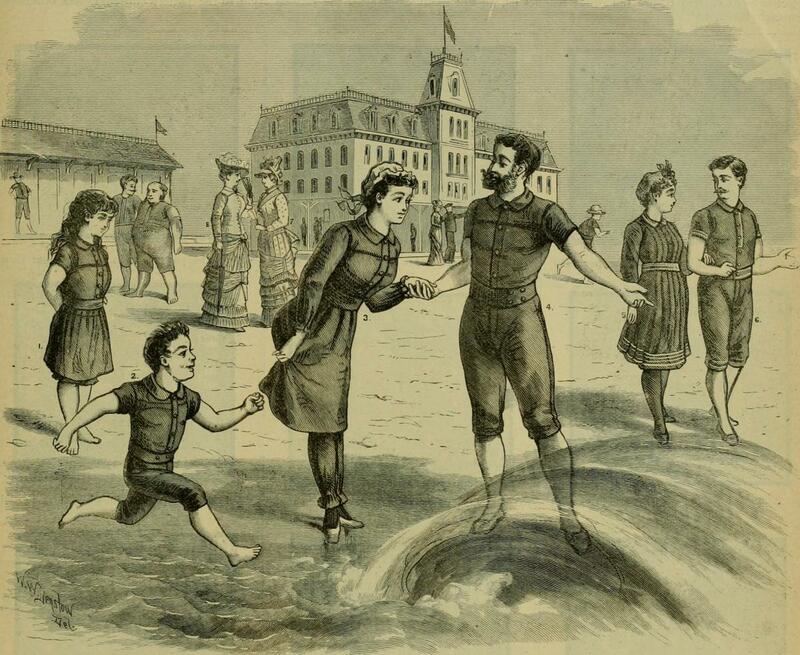 Though women did not engage in actual swimming, bathing was a popular summer activity. Bathing costumes consisted of bloomers worn with an overdress, black stocking, and bathing shoes. By the 80s, bloomers shortened to the knee. By 1885, some bathing costumes were sleeveless. 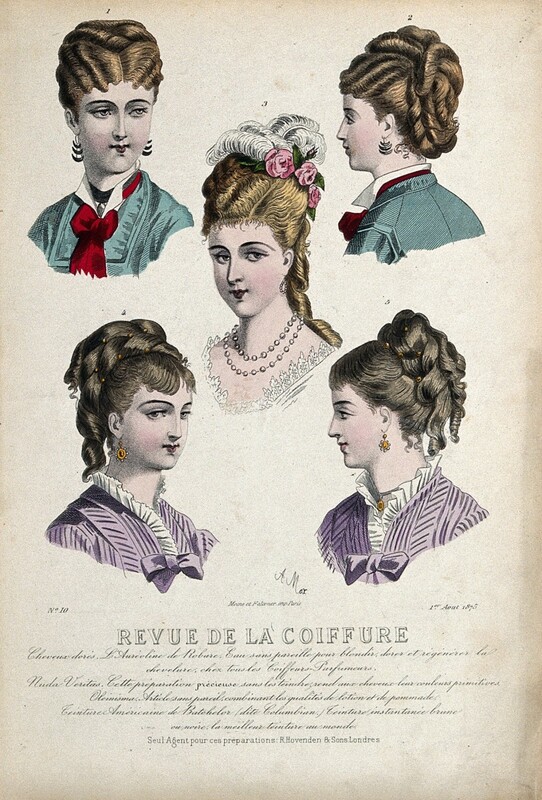 In the 1870s, hair was worn parted at the center and pulled to the back of the head with some curls framing the face. Large braids or long curls hung down the back of the head. As the silhouette sllenderized, hair was worn closer to the head arranged in a tight bun with curls around the edges and at the nape of the neck. Whien large configurations of curls hung at the back of the head, hats tilted up or set on front of the head. Some hats set back resting on a chignon. The back of women's hair often mirrored the back of the skirt. 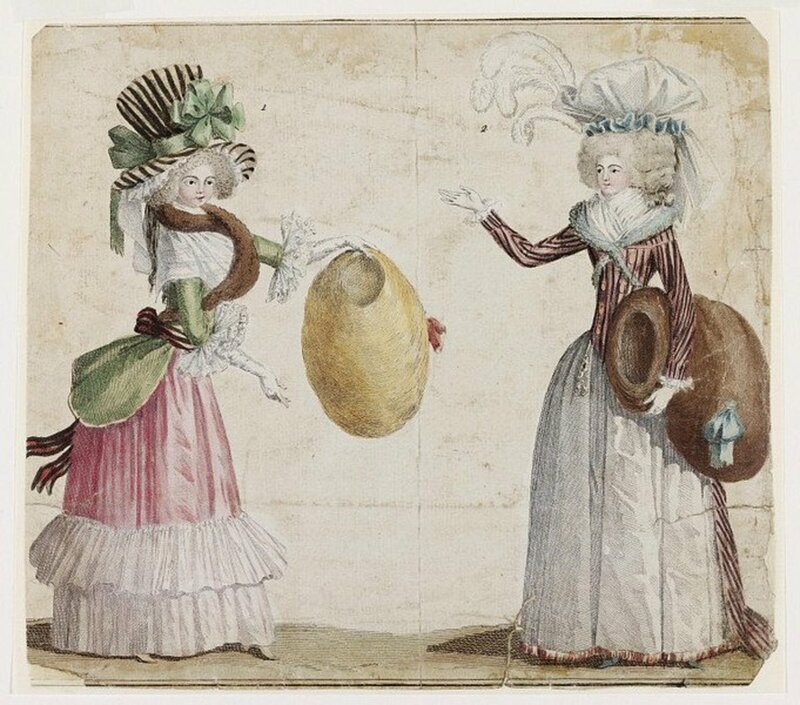 The erruption of large, festooned bustles led women to wear scalpettes or frizzettes which were false hair pieces. 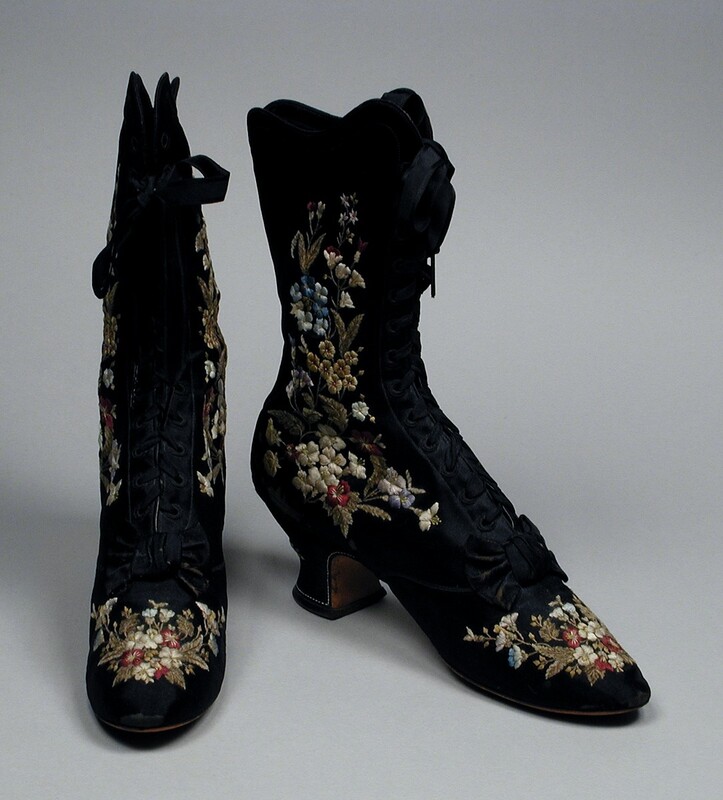 While lower heels predominated mid century, heels rose in the 1870s. Shoes and boots sported high heels and pointed toes. Boots reached lower to mid calf. Winter boots were trimmed in fur. Women wore white boots in warmer weather. Evening shoes or slippers made of white or cream colored leather or satin were sometimes decorated with ribbons or faux flowers. Stockings matched one's outfit or shoes and could be embellished with embroidery or striped. In the 1870s white silk stocking pattered with tiny designs were popular. Black stockings predominated in the 1880s. Gloves were an important part of a woman's outfit. Long, elbow length or above the elbow length were worn for evening with short sleeves. Short wrist length gloves appeared with long sleeves. Folding fans were a popular accessory of the era. 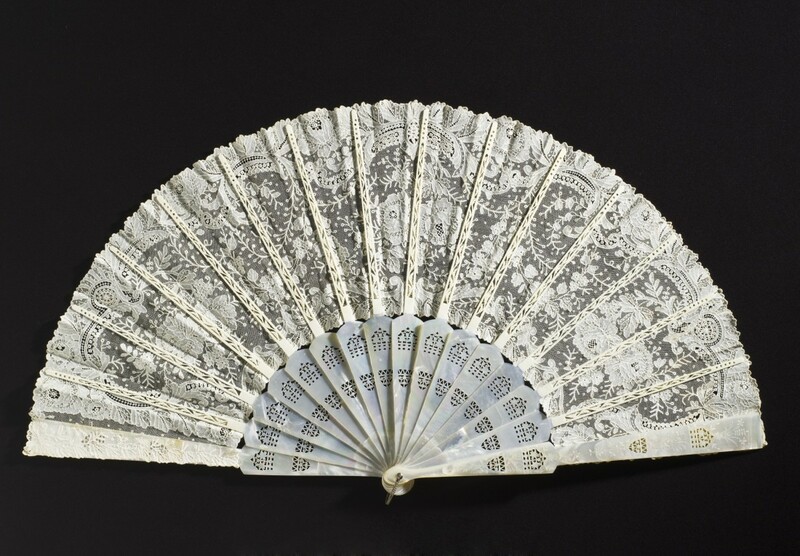 Pretty lace or painted pictures decorated the fan that was supported on tortoise shell, wood, or ivory sticks. Parasols protected women's skin from the sun. Many featured ornate handles and long points at the ends. Trimming ran around the edge of the fabric. The elite wore brooches, hair combs, necklaces, rings, and bracelets adorned with diamonds, pearls, garnets,rubies, and emeralds set in gold. Less wealthy people wore pearls or garnets as well a faux gems. Black jewelry made of jet or black onyx was popular and could be worn during mourning periods when garments were restricted to black following the death of a loved one. Tortoise shell appeared as hair combs and was used to create pique in which the shell was inlaid with precious metal. The discovery of vast amounts of silver led to the mass marketing of silver jewelry, affordable for the middle class. Cameos, those lovely pieces of carved shell or coral, were abundant and worn by the upper and middle class. Many layers of undergarments made getting dressed quite an ordeal. However, each piece was attractive in cut and fabric with tiny embellishments. Corsets made of heavy, pieced and starched cambric offered support with bands made of whale baleen or steel . Corsets covered and lifted the lower bust. Tiny waists were emphasized by a flare at the hips. These uncomfortable undergarments accentuated an ideal figure and were viewed as an essential support for "weak" women. 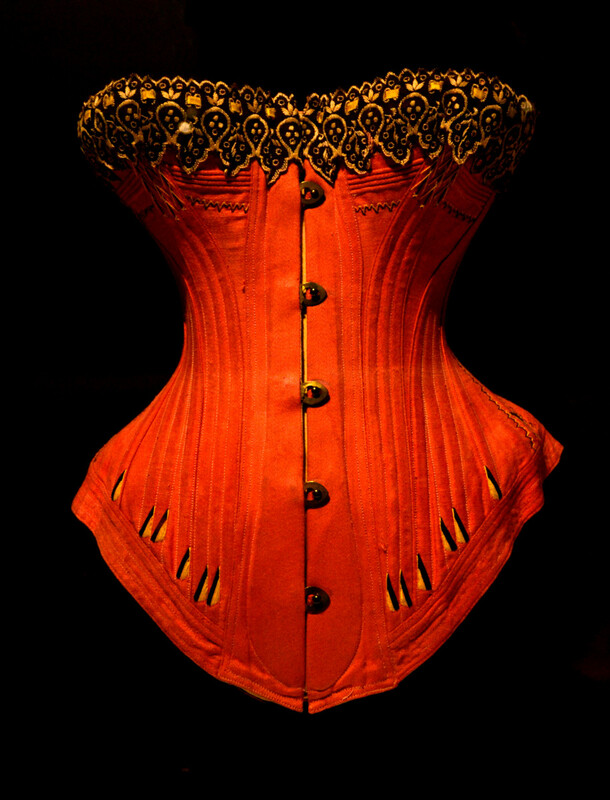 Dress reformers and health professionals reviled the corset and dangerous as well as unnatural. Exaggerated claims blamed this ubiquitous undergarment for miscarriage, cancer, epilepsy, and nervous hysteria. Corset covers hid the stiff lines of the corset. An under bodice was like a sheer, pretty undershirt that ended at the waist. Worn for warmth or modesty under a sheer dress or bodice, under bodices featured pretty trim at the top which could be seen when wearing low necked bodices. A chemisette was like a dickey. The sheer, lacy, delicate garment worn with a low necked bodice could change the look of an outfit. In those days women did not own as many garments as they do today so enjoyed slight changes to add variety to their wardrobes. Drawers tied at the waist with legs ending below the knee. Edging at the bottom was simple, featuring lace, embroidery, or ribbons. Like the drawers of the past, drawers of the 1870s and 80s had an open crotch. A combination was a shoulder to knee garment with legs worn under a dress instead of a chemise and drawers. Made of wool for winter, cotton or linen in summer, this garment proved less bulky than wearing several undergarments. 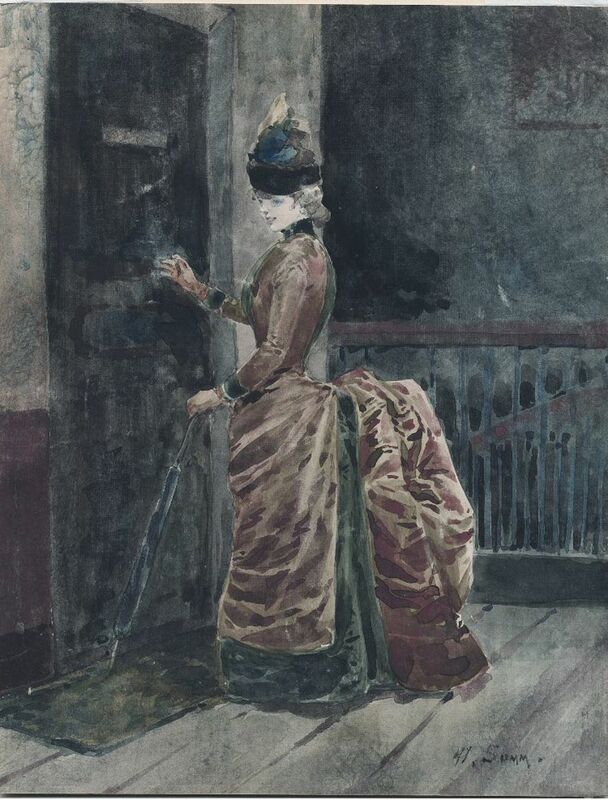 The bustle provided support for dresses and skirts that exaggerated the rear. Horizontal ruffles of stiffened material and horsehair pads tied around the waist. Bustles also appeared as long,spiraling coils worn horizontally, hoops sewn into cambric, or braided,and netted wire. The Langtry bustle could collapse for ease when sitting. Capes and cloaks of the mid 19th century gave way to coats and jackets. Jackets worn tight across the upper back could have a loose or tight front and ended just below the waist. Coats worn knee length or longer were designed and cut to accommodate bustled skirts. Sleeves featured wide, turned back cuffs. The pelisse was a robe like garment that fell 3/4 length or reached the floor. Often high waisted, the pelisse was trimmed with fur. An ulster coast was a log, belted coat with a removable shoulder cape and hood. Chesterfields were slender, tailored coasts similar to menswear. They featured small, velvet collars. Peggy - love the old looks too but they were so uncomfortable. Of course the heavy clothing and fancy bustles were used more by the upper class. Women who did any kind of work had to wear clothing they could move in. 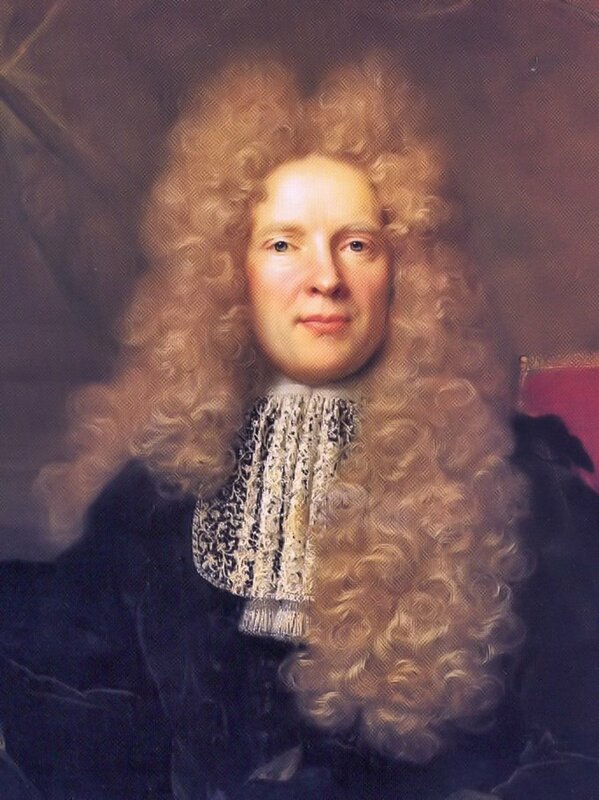 I love viewing paintings of that era but cannot imagine having to dress that way. It is interesting how fashions, architecture and interior design all seemed to blend. 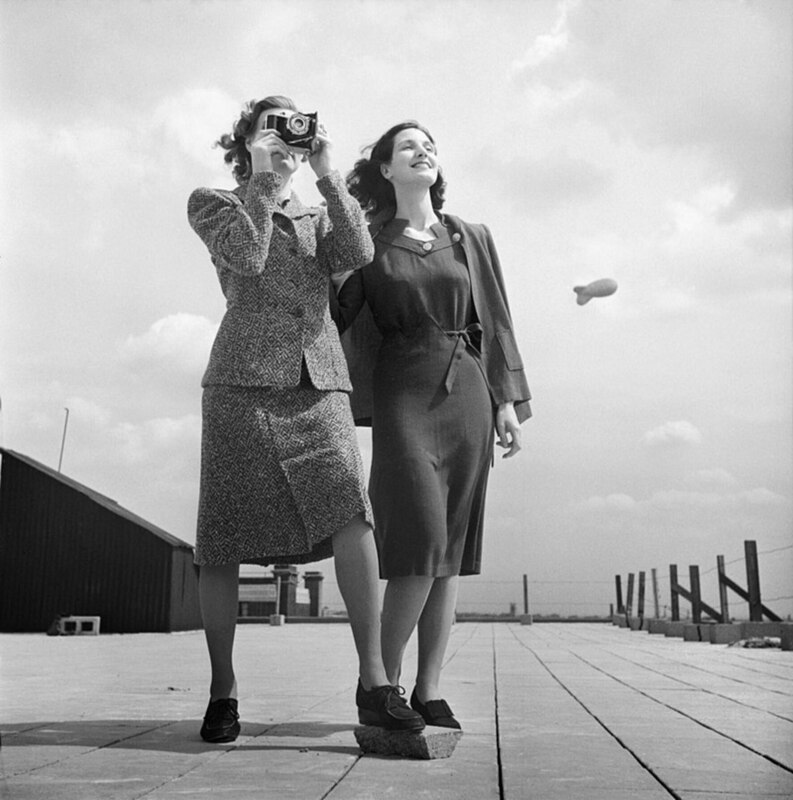 You have assembled great photos to illustrate the fashions of that era. 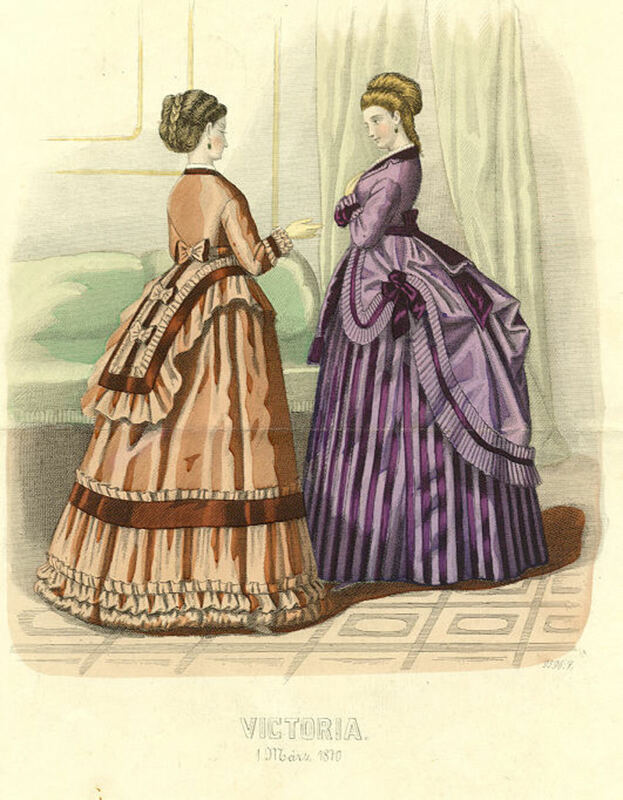 I'm happy that I do not have to worry about buying a collapsible Langtry bustle. Ha! Hi Sweetie Pie - I love the old outfits too. They are so beautiful even when they seem ridiculous like the giant bustles. Thanks! I love looking at art and photos of fashion from that time, but would not want to wear it. Funny how the large derrière seems to be making a comeback, but now more via fitness and squats. Hi Bill - well that's good because you'd probably look a bit silly in a bustle! Hi Blond Logic - I am so glad to live in an era when you can pretty much wear what you want. Back then the servants and working people dressed more comfortably so they could move around. Corsets must have been like torture. Lead was used less in the 1870s and 80s as makeup was considered vulgar and only hints of color were achieved through the use of lip salves, many of which were homemade. Lead was used to whiten the face in the 1700s and earlier. They are so elegant and elaborate. With all that fabric and cinched in waist, I can see why fainting occurred more then than now. I wonder what history will say about the fashions of today. What a charming hub, Dolores! I love the way you link in the historical and social details as well as the other fashions of hairstyles, shoes etc. It makes the whole thing so interesting. How on earth did they ever sit down in those bustles? Someone else could sit on the one in that c1885 picture! Fashion styles are always so intriguing and you always do them proud. Hi FlourishAnyway - I used to have a black lace boned bodice from the late 1880s or early 90s. I was so skinny then that it actually fit. Sadly, it wandered off as do the things we have in our youth. Wish I still had it. Those boots sound awesome. Thanks! Hi simplehappylife - me neither. They could not bend in those corsets. But at home they could wear a tea gown so they could actually move. Fake hair pieces have been around for ages! I love the boots too. Now those I could see wearing! Glad you enjoyed! 2. I had no idea that fake hair pieces have been used for this long (other than wigs, of course). I truly thought that was a fad of our modern times. I love the Victorian style of clothing. Not so much on all the hairstyles and I'd sure hate to wear one of those bathing suits, but this was a real treat of an article. I have a pair of antique lace-up black boots from the era and have often wished I had a lovely dress from this era to display in my home.